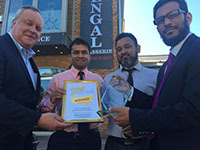 The Bengal Brasserie is proud to announce that our Wetherby restaurant has been awarded the "Best Curry House Of The Year" award for 2016-2017 by the readers of the Harrogate Advertiser. 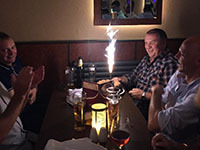 Whether it's a birthday, wedding, anniversary or other special occasion, celebrate at the Bengal Brasserie York, Wetherby or Leeds. Newly Refurbished York Restaurant - Now Open! 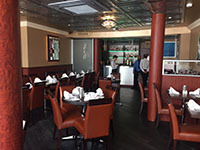 Bengal Brasserie is back and better than ever, good food to dine in or out from our multi-award winning chef. Now under new management - we are extremely proud of the new look Bengal Brasserie in Goodramgate York. Why not pop in and see for yourself. 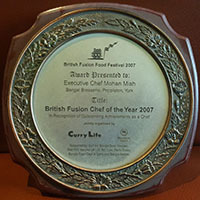 Bengal Brasserie Chef Awarded British Fusion Chef of the Year. Ever wondered why our food is so good? That's down to our multi-award winning chef Mohan Miah. Congratulations Mohan on yet another prestigious award. Game of Thrones Star - Mark Addy Makes Appearance in York Restaurant. Mark Addy, star of the TV hit show Game of Thrones makes an appearaance in York restaurant. Why not join us in Goodramgate - you never know, you might find yourself dining with King Robert Baratheon himself! Don't forget Sunday buffet in our Haddon Road Leeds restaurant - offering a selection of Bengali Cuisine, a choice of dishes which will vary each week. Did you know that the Bengal Brasserie has been one of the top fifty charitable restaurants supporting Princess Anne's charities since 1997? Why not pop in to find out more?